The vendor on-site visit is one of the traditional due diligence standards in vendor oversight. The vendor types which warrant an on-site visit will vary across industries, but a best practice is to perform onsite visits on critical and high-risk vendors. 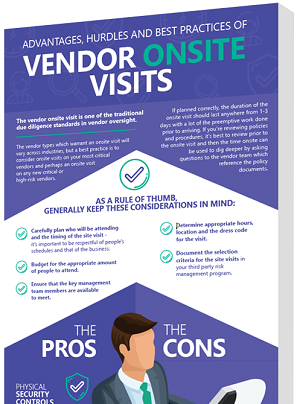 To learn more best practices and tips for onsite visits, download our helpful infographic today.